This spacious Ice King Fridge Freezer boasts a large 259 Ltr capacity and has an easy-access freezer basket for your favourite food items. Also with counterbalanced lid, this adds to the ease of use. Ideal for larger families and built for both indoor and outdoor use, this chest freezer has an internal light and a lockable lid. 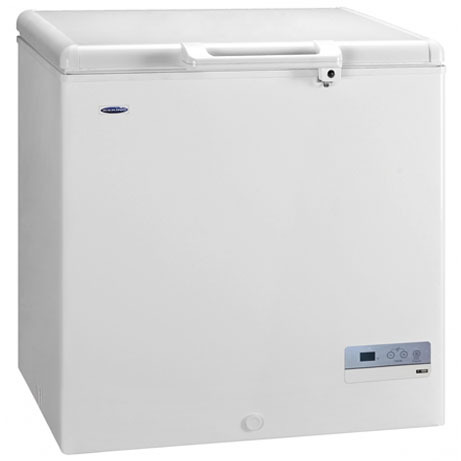 This Chest Freezer comes with Freezer Safe Technology (FST) which will allow you to store your freezer in a shed or garage, in temperatures down to -12c. It also boasts an A+ energy saving rating saving you money. This freezer also has a Super Freezer function for when you get back from the supermarket and need to freezer your items as quickly as possible. This easy to use chest freezer, with indicator lights and an adjustable touch control panel allows you to control the temperature of the freezer. It is the perfect addition to your home. Available in White and comes with a 2 year warranty.